Peach Picking (sorry, apples). And an angry goat. Donuts in hand, we made our way towards the farm animals to get some picks before it got too dark. The babies were rightfully scared by the goat and llama. The llama had crazy, blue ostrich-y eyes and the goat was mental and trying to break through the wire fence to eat my new stroller. 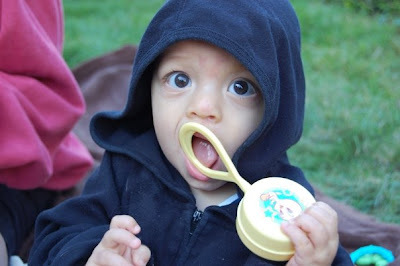 He actually managed to get his head out far enough to lick the handle. Awesome. Then, we checked out the play area for more photo ops. Collette and Sebastian had fun getting their pictures taken on the tractor/truck. Collette was a little too excited and kept trying to reach for the steering wheel so it was hard to get a good shot of them sitting still. Shocker, I know. We let them wander around the back of the truck and they enjoyed that even more. Lastly, here is a pic of FavAuntie with the nuggets - love it when aunties do double duty! It was a BUSY weekend for us this weekend. Friday night, I "worked" at our Mother of Twins club tag sale, helping set up and organize. I was not selling anything but got to shop that night if I worked. This also meant that Billy had to do his very first solo bed time. Sebastian put him in his place by having a total meltdown after his bath. But other than that, he did a great job. I also scored big time at the sale. Spent $100 and got two rocking horses (well, one is a unicorn), two ride on/walker toys, two toy shopping carts, a doll stroller, a bag of balls for a ball pit, two puzzles, 6 pajamas, 3 pairs of shoes, one set of hats and mittens per kid, and a couple tops. The babies are enjoing the new toys, especially the ride on toys (that they don't ride on - they just press the buttons) and the puzzles. Yesterday, FavAUntie and I took the kids to our brother's house to visit our niece and nephew. Our nephew, Ben, turned 6 last week so we got to wish him a happy birthday. Later, we took the kiddos to the Carter's outlet store and got some very good deals on fall clothes - 15 pieces of clothing (shirts and pants) for $43! Not too shabby. PS - there is an online printable coupon for 20% off any purchase over $50, good until Wednesday. 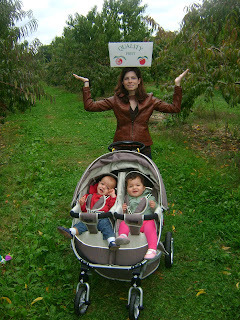 FavAuntie and I will probably take the babies apple picking tomorrow - gotta take advantage of her while she's here!! So, I'm thinking apple crisp, apple muffins, maybe even an apple pie? Gosh, I love fall!! It says that it weighs 26 lbs. but it sure doesn't feel that heavy. It feels like pushing nothing which is the mark of any good stroller, IMO. This stroller is tiny. You know, for a double stroller. Yes, overall it's bigger than a bare-bones double umbrella but not by much. This does mean that the seats are "slim fitting" but unless you gave birth to that 19 lb. baby, (or feed your kids a strict diet of french fries, root beer floats and Twinkies), this won't be an issue. 3. Easy to fold. And use folded. This folds down very easily (instructions are clear so I'm not going to paste them in here) and when folded, you can pull/drag it behind you like a roller suitcase. I didn't know about this when I purchased it so that was a fun bonus. The sun shade is very generous but even with that, there is a zippered part that gives extra coverage. Great for afternoon strolls when the 4 o'clock sun is beaming into my kids' eyes. The shade also has some peripheral blockage which deters curious baby hands from destroying store displays. Double bonus. The stroller, unbeknownst to me, came with its own rain cover. It snaps onto the sunshade and around the base of the seats so the babies are in a little cocoon of dryness. No such luck for us mommies but 2 out 3 ain't bad. Because this stroller is lightweight and compact, it can turn on a dime. Think of that commercial for the Dyson ball vacuum - kinda like that. And, it can be pushed easily with one hand. So long as your pug isn't tied to the stroller and pulling it in the opposite direction. Then you'll need both. Also, the handle has 6 positions so it works for me at 5'4" and Billy at 6'3". Most high-end models have individually reclining seats so that's no big surprise here. But, I will report that to actually adjust them, with the baby in the seat, is very easy. One hand if you're adjusting it back, two if you have to pull it up. Still, it's a cinch. And the positions are "infinite" since its just a strap that you pull in and out. The basket isn't bad, but I've seen better. Because the stroller isn't that long (from back wheel to front wheel, it's 35.4", compared to the City Mini Double which is 38.5"), the storage basket doesn't have a huge surafce area. They tried to make up for it in depth, but, depending on how far back you have the kids reclined, it's not super easy to access. Again, it's not bad, just not the best out there. On the flip side, there are little storage pockets on the back of the seats for smaller items like a wallet, cell phone, snacks, pacifiers, etc. When the shade is closed, the fabric seems to hang down and touch the babies heads. It almost makes it seem like they are too tall for the stroller. But you see that when the shade is open, they have plenty of head space. The babies don't seem to be bothered by it, yet, so not a huge deal, but a small disappointment nonetheless. You can see the shade is partially closed and hanging down in a bit near Collette's head. When it's closed completely, the fabric hangs down a bit more. The handle is easy to push with one hand and is adjustable but it's uncomfortable. It's hard to describe, but compared to my jogger, which has a padded handle, this one is not very comfy. Not a huge deal, because the other aspects of it are quite nice. Just seems like they could have made the bar itself more comfortable and it would be perfect! 4. One big sun shade instead of two separate ones. This might be a deal breaker for some parents who are deciding between the City Mini and the Valco Ion. For me, it wasn't an issue at all but I have to point it out. May be more of an issue for kids who often sleep in the stroller or if you have a toddler and a little baby who sleeps all the time on walks/errands. Yes, its a Valco. Yes, I still think it's worth it. But with a $585 price tag, it's out of a lot of people's price range. The City Mini Double (which to me is the other best lightweight twin stroller) is $400. I think I would have purchased that one but when I was making my decision there was some voluntary recall on the City Mini. It turned out to be nothing so don't fret if you have/plan to buy the City Mini. I like the look and feel of my Valco and am happy with it. But my wallet is less than pleased. Makes My Monday: 10 months! 10 months!! We are officially in the double digits - woo hoo! And on this last day of summer, we also have our first EI meeting. Our case worker, B., will be here every Monday for the next 6 months at which time both babies will be reevaluated to see if qualify again. I'll be sure to let you know how it goes. This past month has been another winner. The whining has been up and down but mostly manageable. Collette has been whining a lot less since she learned to crawl a few weeks ago. Now both babies are bored with crawling and focus most of their energy on pulling up. Pulling up on the TV stand (don't worry - the TV is anchored to the wall), pulling up on the couch, the high chairs, old bouncy seats, trash bins - if it's about 2 feet high, they are pulling up on it. Also, Sebastian took a couple of steps on his little baby walker and my camera was no where to be found. As you can see, we are lacking in the veggie department and that is mostly my fault, I have tried a couple of veggies that haven't been embraced (like zucchini pancakes) but others I just haven't tried yet, but plan too. On deck are steamed, sliced carrots, edamame, peas, steamed, cubed squash (summer or winter), sauteed peppers. Still, most any kind of bread is a hit, even naan. Spices have made their way onto Sebastian and Collette's plates - they thoroughly enjoyed my curry butternut squash soup! And they will be eating Tabasco in no time if Billy has anything to say about it. Our 10 month schedule is pretty much the same as our 9 month schedule, with the exception being naps - they tend to be closer to 9 and 1, sometimes even after 9 and 1. From what others have told, the same happened to them so we're just going to roll with it. I'm also working on pushing back bedtime in preparation for daylight savings. Did anyone else have to gear up for the time change, or did you just make him/her/them "sleep" an hour later? Collette about to crawl off the chair and Sebastian trying to roll over her. 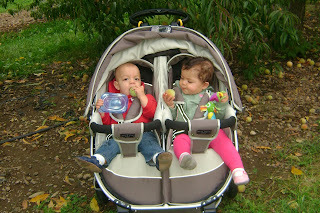 Coming soon: review on my new Valco Ion 4 Two stroller! In the meantime, check out some other Monday Makers at Twinfatuation. Naturally, having as many, if not more, adults than babies makes any outing easier. Of course, those adults need to be willing and able to help with the babies (playing, soothing, feeding, etc.) for this to actually be helpful. I have been with plenty of people who take a very hands-off approach to my kids and I therefore cannot include them in the ratio. But, when I go to my aunt's house for cook out, there are usually 10+ adults and only my two babies. This is a very sweet ratio that makes for an enjoyable afternoon. Sebastian and Collette are very easily distracted when we are outdoors. It seems that I don't need nearly as many toys as I do inside - just watching everything around them is entertainment enough. New England weather doesn't always make this a possibility but take advantage of those sunny enough, not too hot, not too cold days and head outside. A blanket on the grass, a park with swings, a walk around a park - all good! 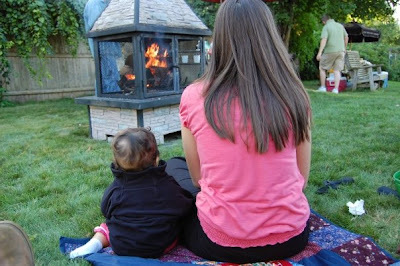 A fire an a cool afternoon is a great outdoor distraction for babies and grown ups! With two babies, the likelihood that something could go wrong is high. Babies are unpredictable little creatures and you can't plan for every possibility. Therefore, you have to take it easy. Don't plan all day activities every Saturday. Maybe stick to activities that will take a couple of hours. This is much more manageable and decreases the likelihood of meltdown. Take on small challenges (quick grocery store trip, farmer's market) instead of big ones (all day IKEA shopping bonanza, day-long beach party). I'm sure this advice holds true through the teenage years but now that we have solid food babies, it is one of the biggest parts of planning an outing. My diaper bag has a canister filled with rice puffs for quick snacks - ideal for giving the babies while you are waiting for their food to arrive at a restaurant. 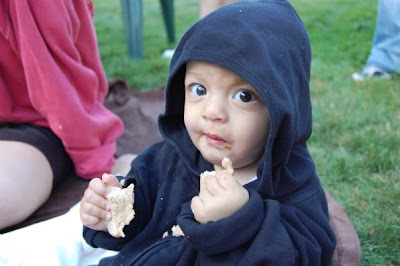 On walks/trips to the park or mall, I always have bagels, crackers or baby biscuits which are easy to hold onto while they chew on them. It may be tempting to head to festival downtown because it would be so fun for the whole family. But, if that festival takes place during nap time, I can be sure my kids will not appreciate the trip. I often pass on things that run smack in middle of our naps because it's simply not worth it. And if I say I'm doing something for them, how is it really for them if I am disturbing their precious sleep to do it? If you have to do something, by all means, do it. Maybe fit naps in around it - move naps up and hour so you'll make it in time or move them back so you can stay as long as you need to. But don't mess with naps just because - it's no fun to soothe to tired, crying babies, even if you got some fried dough out of it. Going out to eat with two babies can be daunting but its SO doable. As i mentioned above, bring snacks for before the food arrives and respect naps. But, you also have to pick a good place. We have taken the twins out for breakfast, lunch and dinner an d have had mixed success. The key is pick a place that can get you your food fast, has an easy escape route, and won't get mad at you if you end up with two screaming babies you left a huge mess under the table. We made meals work at Bickford's, Legal Seafood (surprisingly!!) and Rain Forest Cafe. We order as soon as we sit down, don't choose things that will take long to cook and get the check as soon as we get our food. When I'm alone with the twins, I try places like Bruegger's and Dunkin' Donuts because they are even faster and easier to get in and out of than a proper restaurant. What do you do to increase the odds that your outing will be a success? The other day, as I was packing up the babies into the car after a walk, I saw this woman that looked so familiar getting out of her car. For a while, I couldn't place her. She had a baby, but just the one, so I knew she wasn't in my twin moms group. Then, it dawned on me that she was one of the moms "living" in the NICU when Sebastian and Collette were in the hospital. I wasn't 100% sure it was her, not fully trusting my sleep deprived, post-partum memory but asked her how old her baby was, to see if it made sense. Turns out, her baby is now almost a year old, after spending 2 months in the Special Care Nursery. At the time, I didn't realize how long that little baby girl had been there but now it makes sense, remembering how well her mom knew the nurses. We chatted for a bit, got to see each others babies, big and strong and nothing like the premature little newborns they once were. She asked me if I was going to the NICU reunion, which I had totally spaced on. It's this Sunday and I figured, what are the odds that after all this time I would bump into her this week? I guess that means I should go. I have a bunch of preemie clothes to return to them anyway and it will be nice to see some of the nurses that cared so well for our little ones. After seeing her, it got me remembering our time in the hospital - short, in comparison, but to us it felt like an eternity. Collette was in the hospital for 12 days, Sebastian 13. To this day, that NICU time has really impacted me as a mother. I get very anxious and stressed when the babies do not finish their bottle/food. There was a time when this was reasonable, like when they weighed 5 lbs and were yet to make it on the growth chart. Now, however, its just insane. Collette weighs over 21 lbs! Big deal if she doesn't finish her bottle. I'm getting better about it but there are times where I get so worked up and frustrated that I have talk myself out it, because those days are long gone now. Its like PTSD, I swear. Their NICU time also made me a bit of a schedule fanatic, but that has been a blessing and a lifesaver and I am so thankful to those nurses for getting us off to a good start. Of course, I do have other hang ups and regrets about their NICU time that I have alluded to in the past but don't want to get into here. Mostly just about their approach to fattening up babies and how that lead to no BFing for us (and my aforementioned PTSD vis a vis feeding). But all in all, it was not a horrible experience (as I dreamed it would be before I had the twins) and I'll be happy to show off my almost 10 month olds at the reunion this weekend. 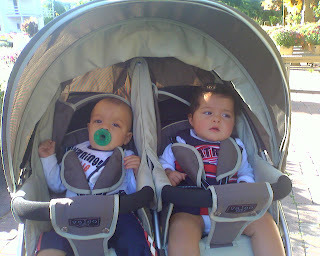 Since my camera still isn't connecting to my computer, here is photo of the twins from their hospital days - this is the very first one of them together, so its near and dear to me. I love that Bettina still looks cute after half a marathon! Sebastian's future in 56 years and 22 years, respectively. Yes, my dad has a walking stick. But I say, if you are 57 years old and walking 26.2 miles, you're totally allowed. Great job Dad, Nick and Bettina - you're awesome!!! And purchased a 5th stroller. Yes, you read that correctly. My garage and car currently house 4 strollers: my BabyTrend Double Snap'n'Go, a hand-me-down Graco DuoGlider, a very used Maclaren Twin Rally and my beloved Schwinn Double Jogger. Obviously, we have outgrown the double snap'n'go and I am just going to sell it. 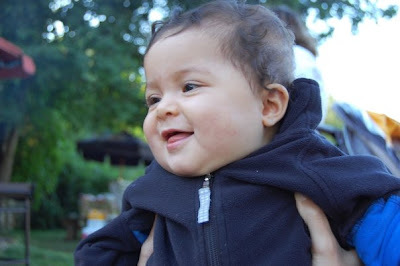 It's in pretty good condition since two of the 7 months we used it, I rarely left the house with the babies (winter + twin newborns + prematurity = lots of staying at home). The Duoglider I hang on to because I have these special winter covers that only fit a 3 point harness and so they are on that stroller. I kept thinking I would use it come winter but who was I kidding, really? I tried it again the other day and now that I have big babies, the back twin reaches forward to scratch the head of the front twin. So, now I know I will never try that stroller again. We bought the Maclaren for cheap because we figured, hey, Maclaren makes good strollers, right? Wrong. We thought it was fine when we picked it up but then we used it a couple of times and realized that it's a piece of crap, albeit a lightweight piece of crap. It can be pushed just fine on a very flat surface but still feels like it will break apart at any moment. Forget using it on a sidewalk, even just to go from store to store. It would be fine in a pinch, or for a grandparents' house, but my parents never take the babies without me so we really have no need for a crappy but usable stroller. Dammit - I just realized I already have 5 strollers! I have a single umbrella stroller and am in the market for a second single umbrella stroller, one for each twin. God, help me now. I am not very sentimental or spiritual. I'm a pragmatic, logical, get-down-to-business kind of girl. But today is September 11th and it's one of the few days where I break from this. I said a small prayer this morning and, like most people praying today, I prayed for the families who lost loved ones 8 years ago. But then I prayed for the people who orchestrated the strike. I prayed for their families, supporters, followers and anyone else who believed/believes in their cause. Now, many people may not see it this way but I think they need our prayers just as much, if not more, than the victims of 9/11. Every year on this day, I think about how much hate had to fill someone that they would agree to join in and/or support the effort to kill thousands of innocent people. I feel for the children who, as I write this, are being taught to hate. And not just children in the Taliban or Al Qaeda but children everywhere. Even in our own U.S. of A. I count myself lucky to not be among the hateful, thanks to mother, who taught us otherwise. But there are members of my very own family who are hateful and so I know how truly sad it is. This morning for the first time, I realized that now it is my job to teach someone not to hate. My children will never know the tragedy of 9/11 the way we do, having lived through it. But I am sure that they will have questions and fears. Maybe even anger. That is natural and expected. But I will have to make sure that instead of teaching them be angry and hateful and focusing on the "us vs. them", I have to teach them to forgive. Turn the other cheek. I have to teach them that even when we are wronged, we have to practice forgiveness. Because chances are, those wrongdoers are suffering more than we know and probably much more than we ourselves are suffering. It will be responsibility to teach them to understand and empathize with all others, not just people who look and talk and think like us. I have to teach them to be citizens of the world and the task is daunting but it's one of the reasons I took the job. I proved you wrong, Daddy! Although we are thoroughly enjoying parenthood, Billy and I feel like sometimes these infant days/weeks/months just drag. Little milestones and accomplishments seem to take forever. They start to do one thing (sleep through the night, roll over, sit up, etc.) and then it's a month later before they do the next thing. S...l...o...w.
Billy decided a while ago that they will simply never walk, talk or have teeth. Well, he was wrong on that last one. My little boy was gnawing on my finger this morning (lovely!) and I suddenly felt something sharp, Holy crap, a tooth!! Billy almost got me believing in a toothless, wordless future that I had forgotten to expect them. You can just barely see it peeking through so I can't take a picture and even if I did you wouldn't be able to see because I still haven't fixed my camera cord/computer feud. And, in other milestone news, both Sebastian and Collette are pulling up. The other day, I caught Collette standing up in her crib (that just days before we had moved down - thank goodness!!!) while I was getting Sebastian downstairs. When I saw her, it almost scared me, like some creepy stranger had broken into the house for the sole purpose of standing her up in her crib and freaking me out. But alas, no crazy people. Just a baby girl getting less baby and more toddler every day. Sebastian, not to be outdone, has evolved from pushing up on low pieces of furniture to pulling up using taller pieces, He especially like to pull up on the bouncy seat, the part where the toys hang from - it's sturdier than it sounds and is the perfect height and shape. And here are a couple pictures that I lifted from my cousin's FB page - thanks Brett!! We were enjoying a Labor Day BBQ - I'll post on that tomorrow now that I have lots of pics to steal. I haven't posted pics of the kids in a while and I haven't posted in almost a week. Sorry. I have one good excuse - my camera cord is in a fight with my computer and they are no longer speaking. So, I can't upload photos, photos which go with posts I plan to write, hence the writer's block. In the meantime, a few things that don't require pictures. First, I've deflated! I'm am now the proud owner of one D-cup and one C-cup. I guess it's time to go bra shopping. In other personal news, I have 26 mosquito bites from our Saturday night cookout and am running dangerously low on Caladryl. So, we saw Dr. C on Monday and all went well. This was my first solo doctor visit - usually Grammy comes with me but I was under the impression that there would be no shots. Turns out they did have to get one shot for Hepatitis B, which I thought was an STD but I guess not. Collette was a trooper, just a whimper and then she was A-OK. Sebastian cried but calmed down with a little mommy-time. They would have had a flu shot ('tis the season!) but I hadn't talked it over with Billy (I wasn't expecting the pedi to offer it at this appointment) so I said I would wait. I'm not sure if we should do it or not. If they were in daycare or had school-aged siblings, I would say yes for sure. How have other people made this decision? As for stats, Collette is a whopping 21lbs, 3oz. and 29.5 inches long/tall. Sebastian is 19 lbs, 3oz and 29.25 inches long. Not sure of the percentiles but I know that Collette is up there and Sebastian is average-ish for height and around the 10th percentile for weight. And this officially makes Lola the smallest baby in the house, as she weighed in at 18lbs, 7oz at her vet check-up last week. So, watch out Lola - those babies will be chasing you around the house soon enough! 6:00am - I get up. 6:30am - Get twins out of their cribs and have bottle. A bit of playtime in the nursery. 7:00am - Downstairs to play while I make breakfast. 8:00am - Up to the playroom for more playtime. 10:00/10:30 - Get up from nap. Have a bottle upstairs. Playtime. 12:00pm - Downstairs for lunch. A bit of playtime. 2:00/2:30pm - Get up from nap. Have a bottle upstairs. Playtime. 3:30pm - Outing of some sort. 5:00pm - Back home for dinner. Playtime. 6:00pm - Start bedtime routine: bath, bottle, story, bed. This mostly works but there are some kinks. First off, Sebastian often gets very fussy in his high chair, to the point where he often eats very little of what is being offered. Now, this wouldn't be such a big deal if I didn't have Collette to keep feeding. My thinking is that he is not so hungry and would rather play. If this is the case, then I am considering doing breakfast before bottle. But that comes with its own issues because they have not been drinking their full bedtime bottle, leaving them very hungry when they wake up. I just feel like feeding times are not well-aligned with hunger times. This also has me considering 3 8oz bottles instead of the 4 6oz bottles - same total amount just spread out differently. As always, I am open to suggestions! Your solid food suggestions have been very helpful and I will be trying some different pasta shapes, (very) steamed veggies and more frozen fruits.